Out of an old box and a few gift bags was born a puppet studio with Zebbie, Mr. Weezy and Bolie; three of the most adorable characters ever. I was about to throw away an old box and I said wait a minute I can use that for my background. 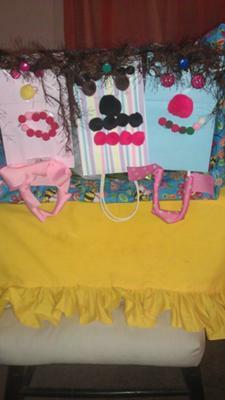 I bought a few gift bags with pompoms and a few other items and I looked at the bags and said what will you become? Who will you become? And there began my creative journey for The Puppet's Nose. I think kids always need to hear stories about differences being celebrated and appreciated especially in the age of bullying. Of course bullying has always been around but never before so much in the spotlight and media as it is today. I thought it would be a good idea to make the differences of the puppets so grand that they couldn't remember why they felt bad about being teased in the first place. Beauty comes in many different sizes, shapes, colors and forms and The Puppet's Nose is the beginning of the journey to self love. The earlier we can learn to appreciate ourselves and others, the more fulfilling and glorious our lives will be long term. I truly enjoyed this project!